Introducing the GSP-1700, the smallest, lightest satellite handset from Globalstar. Its convenient size and increased functionality makes it a must have communication tool wherever your business or leisure pursuits take you. The GSP-1700 is designed to take you beyond cellular and landline communication, making you more productive and keeping you in contact with work, friends and family, even from afar. New ergonomic redesign, advanced features and reduced size make the GSP-1700 an indispensable tool for business and a must have on your back country trips. The Globalstar phone offers an ergonomic design that makes it comfortable for hand-held operation. The phone measures 225cc in total volume and weighs 200 grams (including battery). The height is 135 mm, the width is 55 mm and the thickness is 37 mm. The antenna, when held in a vertical position, communicates with the Globalstar satellite at elevations more than 10 degrees above the horizon. 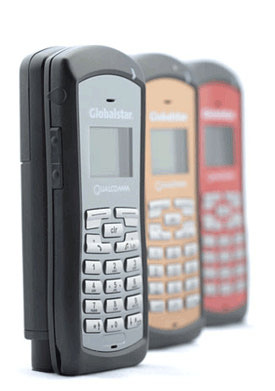 For convenience, Globalstar antenna rotates and stows into handset when not in use.